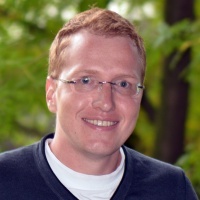 Wolfgang Wiedemair joined the group in October 2013 as a post-doctoral researcher. His research focus is on numerical modeling of biomedical processes such as oxygen transport and blood-brain barrier opening as well as the experimental validation of the latter. He is also interested in the physics of MRI and other medical imaging modalities. Wolfgang finished his PhD at ETH Zurich under the guidance of Prof. Poulikakos in August 2013, developing a multi-domain modeling approach for the coupling of ultrasound and intravascular gas microbubbles, exploited in blood-brain barrier opening and other medical applications. The established computational platform allows for the assessment of mechanical conditions in microvessels caused by the microbubble dynamics. He received a Master’s degree in Physics from Graz University of Technology for his research on non-invasive arterial spin labeling for lung perfusion quantification using MRI, conducted at the German Cancer Research Centre and the University of Heidelberg under guidance of Prof. Schad. As undergrad, he spent a summer as a research student at CERN’s Atlas detector subsequent to an academic exchange year at the University of Geneva, where he focused on high energy particle physics. Following his graduation he worked on the design and characterization of organics LEDs at NanoTec Center Weiz and Graz University of Technology as junior researcher. He is now working an an Application Engineer at Zurich MedTech AG, developing tools and best practices for targeted life sciences applications to simulate, analyze, and predict complex and dynamic biological processes and interactions.